We were driving home from Amirim when we saw them. Silhouetted against a dusky sky, two helicopters were climbing their way over the hills with the Mediterranean behind them. Who would have thought the sight of two ugly military helicopters flying north could make us whoop with delight and almost swerve off the road? Gilad was on his way home. 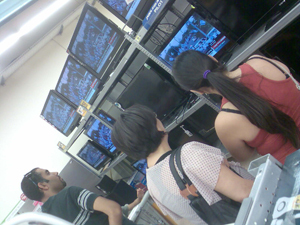 We stopped in the local supermarket to do some pre-holiday shopping, but found ourselves drawn to the electronics section. There was a wall of plasma screens, all tuned to Channel 2, volume on full. As the live coverage showed the Shalit family clamber out of the now-parked helicopter and make their way home in convoy past the cheering people, we found we weren’t alone. Over forty people were crowded round the TV screens, their trolleys half-full, staring at the images as a grandparent might stare at the video of a grandchild’s first steps. We all shared snippets as we watched: how none of us had been able to get dressed in the morning, so fixated were we to the news; how frail yet indomitable Gilad had seemed in the Egyptian TV interview; how Iscar had continued paying Gilad’s father’s salary throughout his full-time campaign to free his son. Then we saw the family reach their house, shuffle through the singing crowds and the flying white flowers, and close the door behind them. Everyone breathed a sigh of satisfaction, wiped away the tears that had gathered or overflowed, and wheeled off back to the shopping. 1. This is a crazy inexplicable country. Strange wonderful things can happen here, though rarely because of strategy or logic. This place and this people is ruled by the heart, the spirit, and the soul. For good and for bad. It’s a ridiculous way to run a country, but we must work with what we have. Whenever we begin to talk about ‘logical solutions’ to conflicts in this region, or ‘mutual interests’, we must learn a lesson from this prisoner exchange. For sure politics and interests were involved, but the engine was more emotional and spiritual than rational. 2. How often in the past few decades has this country shed tears of happiness? I guess it is a rare thing for any country to elicit what is, generally speaking, a family kind of emotion. But tears of sadness, despair, and even rage flow in abundance here. Yesterday the tears were happy, and they were shed both by Israelis and by Palestinians. 3. We didn’t see much of the Palestinians’ celebrations. To see that you needed to switch to CNN or BBC, because Israeli TV wasn’t interested. I normally rail against this insularity, but not yesterday. The many families whose loved ones were blown to pieces by the same people hailed as released heroes in Gaza, did not need to have those images pushed in their faces. None of us did. 4. Which led me to wondering about this unique occurrence, a day when both Israelis and Palestinians are celebrating the same event. It doesn’t necessarily mean anything. If past experience is anything to go by, it probably will change little, but it’s worth noting nevertheless. Sometimes a light in the darkness is just a flash of a gun, but sometimes it can be a lighthouse, and sometimes it can signal the distant end of a tunnel.